CLEARING OUT SOME CLOSETS in the Doheny Mansion basement, we came across a sort of papal reliquary, complete with a skullcap once worn by Pope Pius XI. While he occupied the Chair of St. Peter (1922-1939), Pius XI would have been well aware of an oilman and his wife in Los Angeles, Edward L. and Estelle Doheny. Throughout their lives, the Dohenys were important donors to the Catholic Church both in Los Angeles and in Rome. 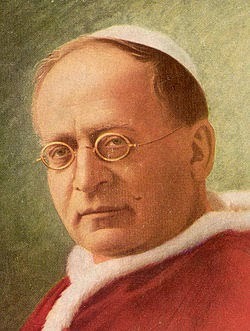 Pius XI in white zuchetto. There's no provenance with the cap, which is part of a framed, handwritten apostolic blessing for the Dohenys, but it's safe to assume it was presented to them in gratitude for their generosity. The cap is known as a zuchetto, meaning "little pumpkin" in Italian, the top half of which it slightly resembles. The papal version is made of white moiré, or watered silk, and lined with velvety white kid leather. Unlike a Jewish yarmulke, zuchettos have no religious significance and probably originated to keep clerics' heads warm in drafty churches and palaces.